Here are the slides from the lightning talk I gave at a RailsGirls Berlin event on Saturday. It’s basically a lightning talk version of my blog post “I love Software Development, because it’s very collaborative and communicative”. As such it is about how the view the general public seems to have about programmers/software developers is actually pretty wrong as we actually communicate and collaborate a lot. I often have the feeling that programming and software development is largely misunderstood. Many people seem to still have ancient believes about how software development works. Believes potentially scaring them away from pursuing a career in software development. Let’s fix this. 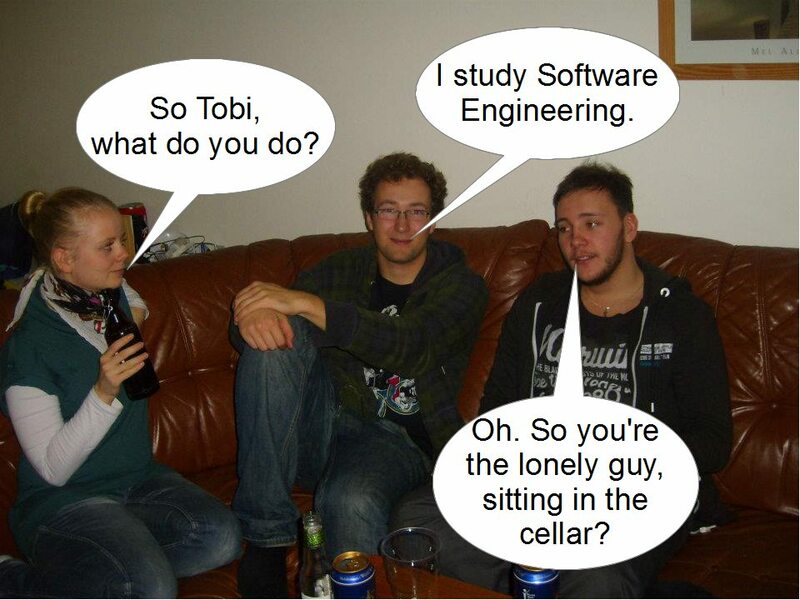 A rather typical conversation at a party. Bingo! You’ve just won yourself a speech of how that is basically the opposite of what I do. My work is filled with lots and lots of communication. Let me walk you through some of the most important and most frequent communication activities in Software Development. Most software isn’t built by a single developer. It’s developed by a team or even multiple teams. I mean does anyone really believe that a single nerd in a cellar builds Facebook and another one builds Windows? This software is built by large collaborative teams. In a team you have to work together to achieve something.The parts developed by members of the team have to interact and play nice with each other. To Facilitate this the authors have to communicate. As software often solves complex problems, these systems also have to be carefully designed. This is best done in a group of people in front of a whiteboard – not in front of a monitor. This is the very first point made highlighting that good software development is about people and how they work together. It’s not only communicating about the project, solving difficult problems together – of course the normal small talk and “grab a drink together after work” is included as well 😉 Motivation is very important. It doesn’t stop here though. Often software projects are big enough that multiple teams have to collaborate to realize them. There is a lot of communication going on there as well. But there are still other people developers should communicate with like the system administrators and the customers. Wait, what – the customers? Yep the customer. The ones ultimately using the applications. Or the client wanting the application. Unfortunately that thought might seem alienating at first, but think about it. Those are the people who ultimately know what the application should do. They are the ones that will be using it, it should fit their purposes. The only way to know if the application reaches its highest goal, satisfying the customer, is through frequent communication and thereby feedback. That starts with asking them what the application should do and how it will be used. It doesn’t stop there though, it is enhanced through demos of a prototype of the application to verify understanding. Some people take this even one step further. In one of the all time classic books about programming, The Pragmatic Programmer, it is recommended that you spend as much as one week working with the your users before writing an application. This way you should get to know what their work is like. All of this generates invaluable insights and builds trust. Look, there are two of them in front of just one monitor! Yep that’s two developers in front of just one monitor. Actually it’s me and a good friend of mine. So what do we do? Well naturally we are working. We are doing Pair Programming. That is one of us is actually writing the code while the other one observers. We both design the code and talk about it. We work together. Some people think that this is a waste of time. Hell those are 2 programmers, give them 2 PCs so they can write twice as much code! It’s not as simple as that. In software development we constantly solve problems. Solving them together leads to a solution sooner, higher quality code and more knowledge spread across the team. The benefits of Pair Programming are worthy of a whole blog post of their own. Despite the benefits Pair Programming is still a pretty debated topic. Some people despise it. Some people only apply it to difficult problems. Some people say that all production code must be written in Pair Programming. 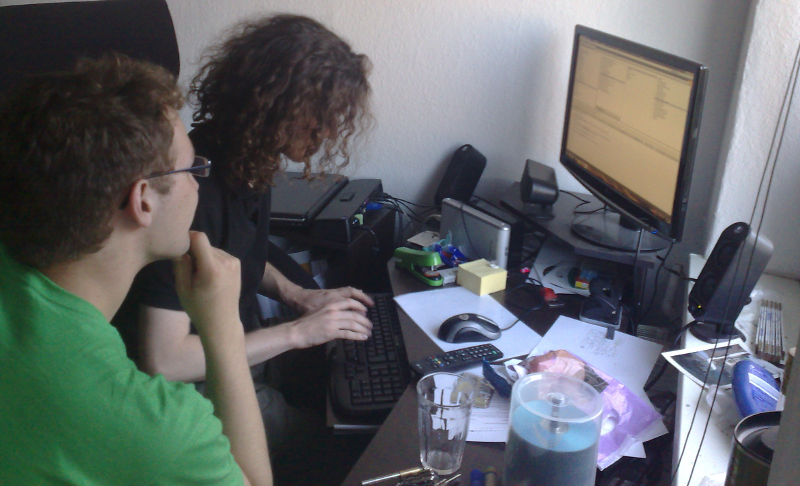 For me I love Pair Programming: It makes programming a lot more enjoyable, at least to me. When you try to solve a complex problem sometimes you hit the wall. You just don’t know how to solve this problem. You’ve run out of options. It can be really frustrating. That never happens to me when I’m Pair Programming. We, as a team, never seem to run out of ideas on how to solve a given problem until we find one that works. On top of that I can communicate and collaborate with someone all the time. How much more awesome can it get? And what’s my point with this? During a good normal work day, I actually communicate and collaborate with at least one person almost all the time. Sweet. Now I really gotta be kidding right? What does code have to do with communication? And that someone refers to the people in your team as well as yourself. As a team you work together meaning that you have to be able to understand and extend the work of your colleagues. And of course you must be able to understand what you wrote some months ago or even just some weeks ago. You might be surprised how difficult this can get with poorly written code. Good code must communicate well. The best code, in my eyes, is the code that is the easiest to understand. Code that pretty much speaks to its readers. Writing such code can be very challenging. You can find me discussing with my Pair Programming partner about naming questions for like 2 minutes – it is important. Does everyone work like that? Not every company empowers their teams. Not everyone loves pair programming. Not every company cherishes communication. Not every company works Agile. There are people out there still following the Waterfall process, which has been a misunderstanding from the beginning, where at first rigorous documents are made and then the programmers are locked away to “just code it”. Why do people keep doing this? I have no idea. I just know that there are enough tech companies looking for developers out there so you don’t have to end up at an old-school command & control enterprise. Well I’ve worked with some people who might qualify as introverts. Let me tell you this: I’d love to work with each and every one of them again. See communication is not a one-way street. It’s not just about talking, it’s at least as much about listening. People who just talk but don’t listen are bad communicators. Maybe more introverted people don’t talk as much. However with the ones I know I found that if they say something it is of immense value. And they are very good listeners as well. 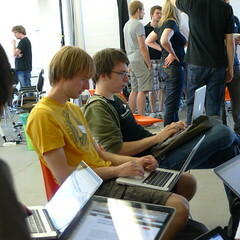 Plus they enjoyed Pair Programming as much as I did. I would say they are good communicators and collaborators. To me bad communicators and collaborators are those that don’t work together with the team and spend most of their time simply criticizing others. So what’s the lesson here? Well today’s Software Development is a lot different from what many people think it is. You work together as a team. You talk. You draw on white boards. You have those funny little post-its to coordinate work. Some people work together all day long. You have fun. You actually communicate with he people using your product. As I hinted at first all this makes me believe that the ability of developer to communicate is more important than his/her technical ability. Developers are part of a team. If they excel technically but don’t know how to share their expertise with the team then they’re not helping much. Even worse, people who spend meetings just criticizing ideas can easily kill the motivation of a team and slow them down significantly. Luckily I haven’t met many of them. 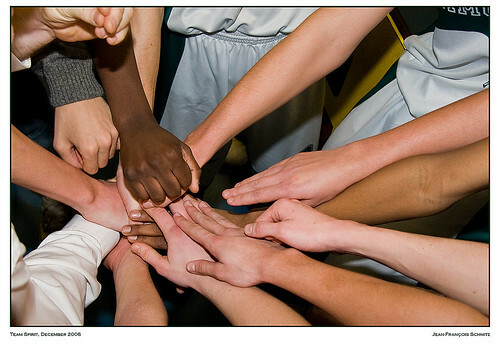 Good communicators and collaborators on the other hand do everything for the team. They help and motivate each other. They happily share their knowledge and are always ready to learn new things. So my point is this: Do you like solving problems? Do you like to work in a team? Would you like to work in a continuously evolving field with lots of new technologies and opportunities? Do you like to build something awesome helping many people? Congratulations, software development might be just the thing for you! There are tons of those projects and initiatives. Let’s meet five of them right now! A screen shot of the original Ushahidi web mashup taken form their about page. Ushahidi means “testimony” in Swahili. It is a project that a group of programmers started in the aftermath of the 2007 presidential election in Kenia. There was a major outbreak of violence and it was simply too hard for bloggers and other people to report all the incidents of violence that eye witnesses reported to them. Enter Ushahidi. It was an application build quickly by a group of programmers to map out reports of violence on google maps, a so called “mashup”. This way they made it easy for people to report incidents of violence and made it accessible to everyone. Well everyone with an Internet connection. Ushahidi has since become a platform. Anyone can download Ushahidi and deploy it for their own purposes. For instance Ushahidi was used after the 2010 earth quake in Haiti to report events. Also Ushahidi is open source, so feel free to help improve this awesome project. betterplace.org is a platform where people can donate for social projects or raise funds for a social project. You may think of it as kickstarter for social projects. Betterplace.org focusses a lot on direct and transparent support of projects. The platform is free to use and they pass on 100% of all the donations. You can see a more thorough explanation of what they do and how this is more effective than conventional funding here. So how do they finance themselves? Well short answer: Some sponsors and friends help them. Moreover donators are free to give a little extra money to support betterplace. There is also a longer answer. The motto of Random Hacks of Kindness is “Hacking for Humanity”. It is a global community building open technology to help make the world a better place. As such it is a prime example of an organization trying to improve the world through the use of software. You can find a list of projects developed in their wiki. Random Hacks of Kindness hosts global events, also called hackathons, where people meet and work on solutions for problems together. The next global event will take place on the first and second December 2012. You can check if there is an event organized near you here. I’ll be attending the event in Berlin, so go ahead and join lots of other people and me. Let’s have fun together hacking and doing socially good. Mission of Mercy logo taken from their github page. Mission of Mercy is a clinic management application for free dental clinics and is used in the United States. This application helps these free dental clinics tremendously by supporting the clinc flow. It was created and is mainly maintained by the awesome Jordan Byron, a co-founder of the Mendicant University. Stadt Land Code Logo taken from their home page. A German initiative (English: “city country code”) to support the development of more digital tools for citizens to improve social life. Fields of interest include, but are not limited to: public transport, infrastructure and politics. In general the tools should make it easier to participate and really make a difference. FixMyStreet is a good example of such a digital tool. 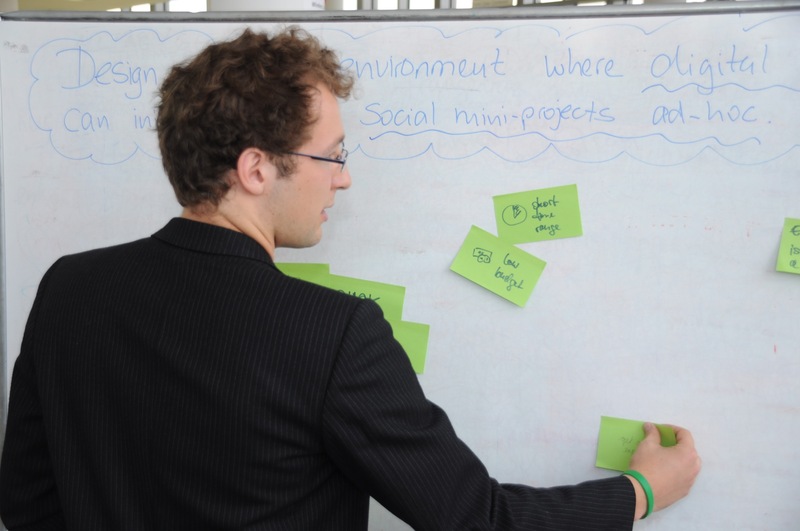 The initiative includes a work shop and the possibility to win a project funding of 2500€. See there are lots of software projects or initiatives having a social impact or aiming to have a social impact. Do you know any other social projects? Please feel free to leave a comment! Many of the projects are open source, so go ahead and contribute or join the next Random hacks of Kindness event near you. Start your own project. Host your own event. It’s up to you. just a quick note I updated my beloved Resource section with some quite nice new resources. I also restructured it so that Ruby and Rails got some distinct sections. When I started this blog sharing resources for learning how to program was pretty important to me and it still is now. I love both teaching and learning. I hope that these resources can help you to learn how to program, teach someone how to program or improve your own skills. But it’s not only programming there, my favorite topic “agile software development” is also mentioned! Most of the resources are free so go ahead and check them out. I gave a talk about the Shoes GUI toolkit/DSL (depending on your point of view) at the Ruby User Group Berlin yesterday and I wanted to share the slides with everyone. Feel free to reuse and alter them for your purpose. Feedback on the slides is also welcome.